...and wave them like you just don't care. 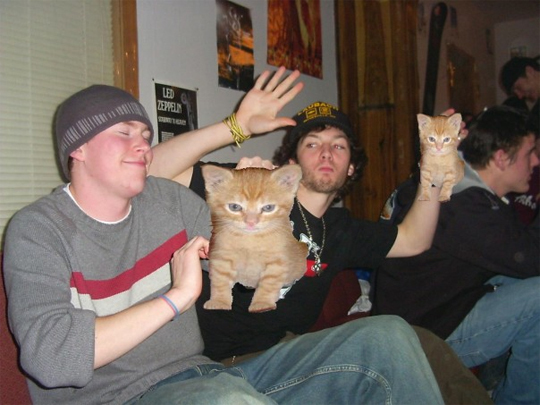 These two dudes are dancing on a couch with their Boozecats. They all look super happy. This image is a Boozecat relic. It was made years ago by Brian V in an attempt to censor his college photos. His school was very strict and had kicked a student out over Facebook photos, so he came up with a similar solution to mine. Thanks for sending this in Brian! Ahhhh, youth…if it was made to hide indiscretions on Facebook, by definition it could *not* have been made “years ago.” It is only five years old!